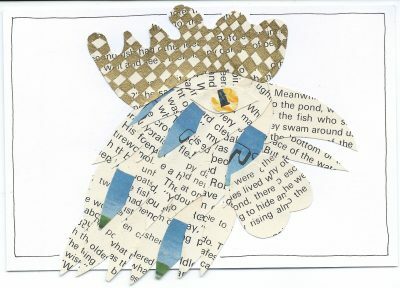 Aha – cut out shape from same paper (fairy tale story in a 1979s album) and then drew on the lines in gold and coloured in. Five blue feathers in this is one of not very manny that state to the right. 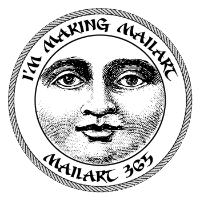 Honestly mailart 365 is one of my favourite things. Very disciplined application of gold. If i were to do that pattern it would be a right old overlapping mess! Sitting in my shed at allotment and thinking I might cover the walls with mailart.